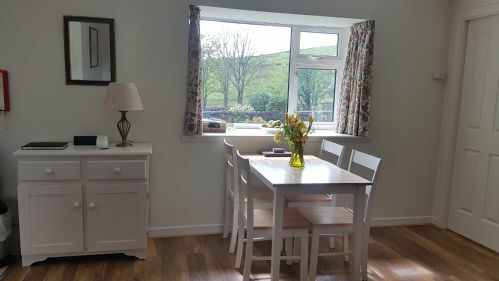 Rowan Cottage sleeps four in 1 double, 1 twin room. 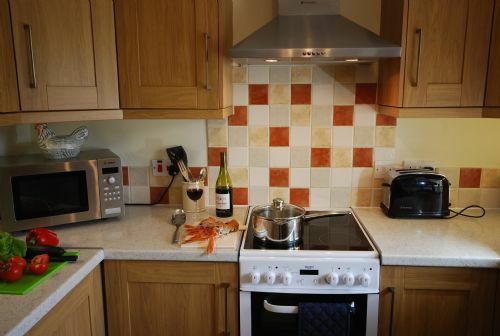 Open plan lounge/diner/kitchen including wood burning stove and fully equipped kitchen with electric cooker, washing machine, tumble drier, dishwasher, fridge freezer and microwave. Courtyard seating at the front of the property and picnic bench in the walled garden to the rear. Maximum 2 dogs accepted. We're glad you enjoyed your week at Rowan Cottage. Thank you for your review and comments. Spent a lovely few days in a beautiful, well-equipped cottage which was well located for exploring the local area. A lovely welcome pack and freshly picked flowers was a well received touch from the owners too. Thank you for taking the time to review us and leave your comments. We're pleased you enjoyed your stay. My husband and I and our two young children enjoyed a wonderful three days at Rowan Cottage. Flowers, milk and shortbread on arrival. Spotlessly clean and everything you could need for a relaxing stay. Loch Seil is only a minute walk away and Oban about 10 miutes drive. Right near to the Atlantic coast. So much to do and explore. It is our third time in the cottage (the first time since the new owners have had it) and we are already planning our next trip back. Oh and the log burner is just what you need after a day out in the cold. Thanks for the review and lovely comments, it was great to meet you all and look forward to seeing you again. 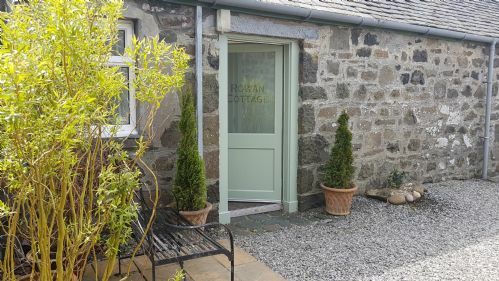 My recent short stay at Rowan Cottage was thoroughly enjoyable. The cottage itself was beautiful and the surrounding area was stunning. The little personal touches from the owners - a welcome hamper basket for my dog and a tray of goodies for me including some amazing homemade shortbread were very thoughtful. I would definitely recommend any of the Loch Seil cottages for anyone looking for a break away in a peaceful beautiful area. Ideal place to stay to explore the west coast and some of the islands. Hi, thanks for the lovely comments, we're really pleased that you enjoyed your stay with us. We had a fantastic holiday in the Rowan Cottage, quiet location and extremely clean and very comfortable. Everything we needed was available and would highly recommend them to friends and family. Definitely staying again. Thank you for your positive comments and taking time to review us. We look forward to your return visit. Spent a really good week at Rowan Cottage. Very well equipped and good wi-fi considering the rural location. I would have preferred a larger double bed but width is constrained by bedroom size. Access to garden is not good as you have to walk around Rowan and Seil Cottage to gain access. Not abundantly clear from website that garden is shared which could cause problems. Not an issue for us as weather was not brilliant and sitting out was not on the agenda. Hi, thanks for taking the time to review us. We are glad you enjoyed your stay, to the extent that one of your party has re-booked for next year. 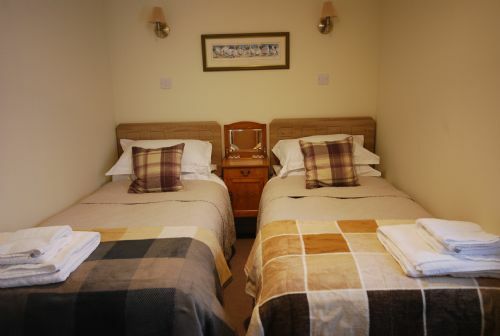 In response to your specific comments, the bed in Rowan Cottage is a full size standard double bed. The room size does preclude a king size bed. 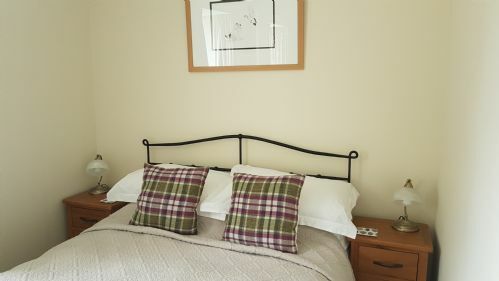 We can offer a king size bed in Barn Cottage. Regarding the garden, I am sorry that you did not like walking round to the access gate, however, we feel the walk through our own larger garden is very pleasant and not too far. We are pleased to be able to offer an enclosed garden space to these 2 cottages so that dogs can be safely let off the lead. The ancient stone wall limits our options for changes. We have provided privacy with a fencing and planting screen, however, in view of your comments we are now considering dividing the whole garden. Whilst this will not alter the access, it should address your comments regarding the shared garden. Again, Barn Cottage has a private enclosed garden with direct access from the back door should you consider visiting us again. Loved our stay in this delightful lochside bolt hole. Thoughtful touches from our hosts including shortbread, Toiletries and doggy treats and blankets. Great walks from the door step and gorgeous trips to small islands nearby. 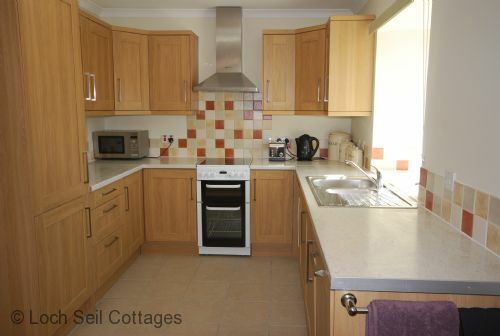 The cottage was beautifully clean and well equipped with excellent local information. It was great value for money for the time of year. Thanks for the lovely comments, so pleased you enjoyed your stay and we hope to see you again. This lovely cottage has everything you need and more. Very clean and everything in good condition. Quiet and comfortable with a lovely garden area to sit out on a nice day or evening. Log burner was great to sit in front of on a chilly evening. Friendly helpful owner who left a welcoming vase of flowers. Very dog friendly and owner left blankets and treats for my dogs. Ideal base to stay near Oban. Wouldn't hesitate to go back. We had a lovely week staying in Rowan Cottage, our hosts were very welcoming and friendly. The cottage was beautiful, had everything we needed! We would not hesitate to book to stay here again! Thanks for taking the time to review us and for your positive comments. We're glad you enjoyed your stay and hope to see you again. The cottage was perfect for our family (2 adults & 2 kids). Very comfortable in a beautiful setting. Many great walks right from the cottage, and location convenient to many other local destinations. Next time we’ll stay longer - so many things to do in the area. Owners were very nice and the cottage had everything needed for a great stay. Highly recommend. Thanks for your review. Hope you will be able to come back and stay a little longer next time! A home from home relaxing experience. Many thanks to Anne + Mike for a wonderful stay. Everything you could possibly wish for was provided. Hi Gill, so glad you enjoyed your stay with us. Thank you for the comments. Beautiful location-very comfortable, clean house-everything we needed and more! Would stay again . Highly recommended. Thanks for your review and lovely comments. We are always trying to improve our customers' experience and if you have any suggestions we are always happy to receive feedback, and you can email us directly on [email protected] with any specific recommendations you may have. What a great location for a holiday. Cottage was a home from home . And it was a ferfect location to tour the area. Thank you for your review and comments, we hope to see you again! We enjoyed our stay, good beds, good kitchen acessoiries, enough privacy, nice surroundings. There is a garden available but no direct entrance towards it. Nice owners. Thanks for taking the time to review us. I hope you enjoyed the rest of your Scottish holiday. We understand about the garden and have not yet found a way of providing direct access, but will continue to look at trying to find a way. Lovely cottage set in beautiful surroundings. The cottage was well equipped and comfortable. There was a welcome pack including dog biscuits which was a nice touch. Garden was lovely, although we couldn't sit outside as weather was typical Scottish summer! The owners were very helpful and even posted on my mobile phone which I had forgotten. Hi, thanks for reviewing us. We are glad you enjoyed Rowan Cottage, we always try to make our doggy guests feel as welcome as our human ones. Sorry we couldn't arrange the weather for you! Maybe next time? If you looking for a quiet holliday with local and cultural cetres near by the location of Rowan Cottage is perfect. Thank you for taking time to review us. You obviously found plenty of places to visit during your stay, I'm glad you enjoyed it. Just returned from a lovely week here, excellent hosts and beautiful cottage, a real home from home in a peaceful location. Hi, thanks for your review, we are delighted you enjoyed Rowan Cottage, it was our pleasure to have you here! We had a lovely family break in Rowan cottage. The cottage is well stocked with all the home from home essentials. It is definitely one of the best stocked self catering cottages we have stayed in, with all the cleaning supplies, and even salt and pepper!! The home made short bread and supply of hit drinks on arrival were a particularly nice touch. Anne and Mike were also on hand to unpack our Tesco delivery before we arrived, which was hugely appreciated. The cottage is very comfortable, and we had a couple of lazy days when the weather was poor, enjoying the wood burner and board are games and jigsaws. Our young daughters enjoyed exploring the enclosed gardens (and the wilder area to the rear under supervision). Notes about walks starting from the property are great and we would recommend the walk to Barncarry bay, which although tricky in places, we managed with our 2 and 3 year olds and the pay off was worth it, having the rocky beach to explore all to ourselves for the afternoon (save for the odd nosy sheep). We also managed a fair bit of exploring further afield and the location is perfect for days trips to the nearby islands, with the owners on hand to offer local hints and tips for hidden gems. 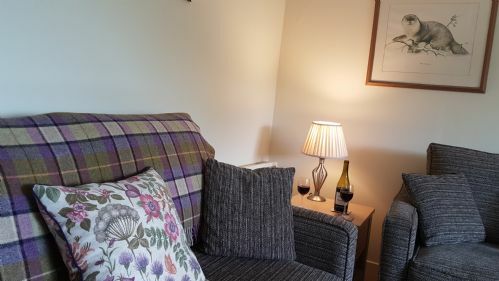 Rowan cottage is a lovely cosy retreat to return too after a day in the fresh air and we all slept extremely well in the comfortable beds. Thank you for taking the time to write such a lovely detailed review, it is much appreciated. We will look forward to welcoming you back. 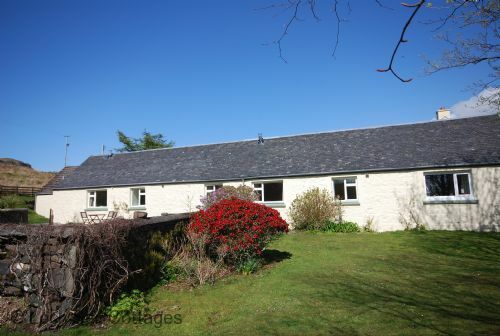 Wonderful cottage in a great location with walks straight from the door. Mike and Anne were very helpful. Definitely recommend as a location for exploring Oban area. Thanks for the review, glad you enjoyed your break. Whilst we always knew the area would hardly be balmy in weather, we were amazed at the warmth of not only our hosts but the people in and around Argyll as a whole. Our two weeks swiftly passed as we sought out each and every avenue the area could offer, from ferry boat sailings to quality fish dinners; gaping in wonder at the Bridge Over the Atlantic and enjoying a drink in the T&T pub; driving excellent and mainly quiet roads, to seeing the beauty of the Isle of Mull with Tobermory and Calgary Bay, and a little further out to the wonderful island of Staffa and Fingal's Cave. Oban is a delightful town, bustling and welcoming and has a cracking distillery tour that's well worth the eight quid fee. We also took in Glen Lonan, Cruachan hydro power station, Inveraray jail, Dunollie and Dunstaffnage castles, the SeaLife centre and when the weather was really poor, enjoyed the comfy cottage, a true home from home. And when we could venture out once more, our friendly hosts and playful dogs kept us pleasantly occupied. Return to the area and Loch Seil? Let's fill up the car and head back ASAP! Hi Andrew thank you for the lovely comments and so pleased you enjoyed your holiday. We look forward to welcoming you back! Well appointed let with privacy and a tranquil, homely feel. 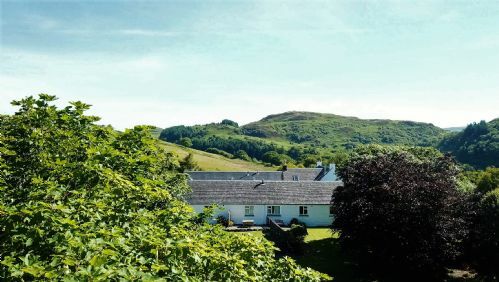 Rowan cottage had everything needed to provide a comfortable, 'family' holiday, in a peaceful setting. The cottage echoed the surrounding country side, and imagine, that it has appeal in all four seasons. Stayed for 3 nights and had a really relaxing, enjoyable time in the sunshine. Cottage had everything we needed, were clean and fresh and were comfortably furnished. Our hosts were welcoming and available whenever we needed them. Cottages are in a good location for an escape to the countryside. Oban is an easy drive away for shopping, and lots of places to visit nearby. Hope we'll be back! This is first class self catering. Many thoughtful extras are included. It is very well equipped and extremely comfortable. The location is excellent for touring the Oban area. Rowan cottage is a lovely place in a wonderful setting. I was surprised by the many thoughtful extras such as a bottle of milk, tea bags etc, shortbread and toiletries. I don't usually see these in self-catering houses. The towels were big and fluffy which we all enjoyed. We also enjoyed watching the many birds in the garden, which was beautiful. My husband and i hope to visit again as we loved the surrounding countryside, so many lochs and islands to visit and local walks to do, none of which we could do in such a short time and in such awful weather! My only, very small, quibble was that it would have been good to have some hooks on the bedroom doors for hanging damp towels on after showering. Thanks to Mr and Mrs Grabham, we'll be back!